METAIRIE, LA — The Sacramento River Cats (33-37) were blanked on Sunday in New Orleans, recording just four hits as the Baby Cakes (33-36) took game two of the series 3-0. Right-hander Mike Connolly, promoted from Double-A Richmond to make Sunday afternoon’s start, was outstanding in his Triple-A debut. He allowed just four hits and one walk in six scoreless innings while striking out three. Making his second relief appearance of the season was right-hander Tyler Beede, who surrendered all three of New Orleans’ runs during the seventh inning. Beede gave up three hits and a walk in the frame. Catcher Trevor Brown was the team’s top offensive performer, reaching base twice with a single and a walk. Right-hander Taylor Hill (1-1, 7.36) gets the nod Monday evening in what will be his fourth start with Sacramento. New Orleans will counter with righty Tyler Cloyd (0-1, 7.07). First pitch is set for 5.00 p.m. (PT). Catch all of the action live online at rivercats.com, on theMiLB First Pitch app, and on the air on Money 105.FM beginning at 7:00 p.m. (PT). WEST SACRAMENTO, CA — The Sacramento River Cats (22-23) were held to zero extra-base hits for just the second time all season in Monday night’s 9-1 loss to the Las Vegas 51s (18-27). Two Vegas pitchers combined to allow one run on six hits and three walks as the River Cats left nine runners on base. Recently promoted infielder John Polonius supplied the lone run for Sacramento with an RBI-single in the sixth inning. River Cats starter Tyler Beede struggled in his 4.1-innings, surrendering a season-high eight runs on six hits and five walks. It’s Beede’s fourth start in which he’s given up at least four earned runs and his sixth issuing three or more walks. San Francisco Giants’ reliever Mark Melancon made his first rehab appearance with a quick six-pitch seventh inning in which he induced two groundouts and a pop up. The Dorados de Sacramento will take on Las Vegas 51s on Tuesday night at Raley Field, featuring left-handers Matt Gage (2-2, 5.03) and P.J. Conlon (2-3, 5.89) squaring off. 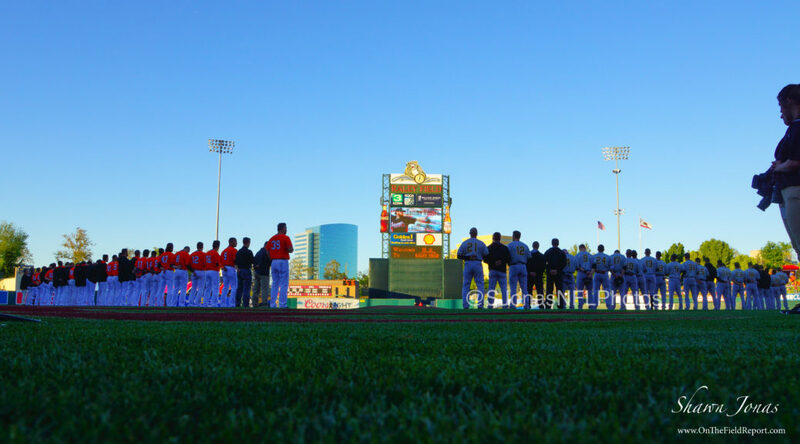 Catch all of the action live online at rivercats.com, on the MiLB First Pitch app, and on the air on Money 105.5 FM.